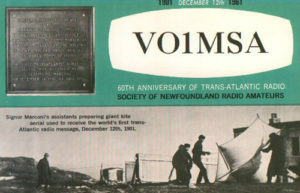 The Society of Newfoundland Radio Amateurs was formed in April, 1959 from the dissolution of The Newfoundland Radio Club. The main purposes of SONRA are to secure the pleasures and benefits of persons interested in Amateur Radio by furthering cooperation among its members, further the interest of Amateur Radio in the community, and provide services to its membership related to Amateur Radio. For a number of years, SONRA has been providing services to all the Amateurs of the Province in the form of a VO callbook, Callplate administration, VO News newsletter, etc, but the growth in the Amateur population over the past few years made this task quite difficult. 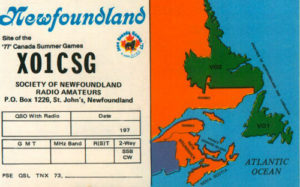 The advent of regional and local clubs around the Island and in Labrador plus a shift in the Amateur population density from the Avalon Peninsula area to the balance of the Province resulted in SONRA being overwhelmed with the expense of providing the services to roughly 1000 Amateurs from the funding of a membership of roughly 300. In 1991 the thrust was reinitiated to form a Provincial organization to administer to the entire Amateur population and in 1994, through the work of Don Wyatt (VO1KX) and Mac Moss (VO1AT), the Provincial organization, VOARA, was formed, taking on many of the provincial responsibilities that were a part of SONRA and allowing SONRA to be one in a list of many clubs operating to serve its members and general area. VOARA is no longer actively operating so all provincially-oriented activities, such as the WAVO award, Smallwood Field Day trophy and the provincial call book were returned to SONRA for continued administration. SONRA continues to operate and hold meetings regularly. The main thrust of the club will be the education of the Amateurs and the operation of those services which have proved to be of great benefit to not only the membership, but to the community as well. Currently, SONRA is involved with many facets of Amateur Radio service to the local community as well as Amateurs themselves. We are affiliated with the local Emergency Measures Organization office to provide emergency communications when called upon. We are affiliated with Radio Amateurs of Canada (RAC) and support the Incoming VO Bureau. We operate an HF station from the site where Guglielmo Marconi received the first wireless transatlantic signal in 1901 and operate a multi-function station from another historic site, Admiralty House, which was used during World War I as a major communications post for the North Atlantic. We are the only group officially sanctioned to operate special Marconi events from Signal Hill through our partnership with Parks Canada. On June 25th, 1997, SONRA helped make history as Paul J. Piercey (VO1HE) and Dan Goodwin (VO1MX) assisted Her Majesty Queen Elizabeth II in making the first amateur radio contact by a reigning British Monarch. 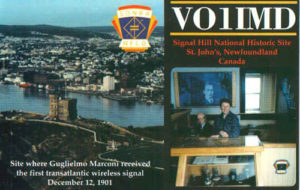 The contact was between VO500JC, at Cabot Tower in St. John’s, NF and GB500JC in Bristol, UK. Martyn Phillips (G3RFX) responded to Her Majesty on behalf of the people of Bristol and amateurs around the World. December 12, 2001 marked the 100th anniversary of the reception of the first wireless trans-Atlantic signal by Guglielmo Marconi. Once again, our club, in cooperation with several levels of government and amateur groups around the world, provided a showcase event while making the historic contact with Poldhu at 1600 UTC. 100 years later we were using technology that Marconi could only have dreamed of; IRLP and contact with the International Space Station. More information about this event can be found throughout our page. In the years that the club has been in operation since 1959, much change has come to the Amateur world and SONRA has endeavored to maintain a link to the past while keeping up with the future. This WWW page is just another step to take advantage of all communication methods possible. We were all shocked and saddened to hear of the passing of Art Rockwood, VO1AX, on August 18th., 2002. Art passed away in Montreal, from a lengthy illness similar to Lou Gehrig’s Disease, involving neurological degeneration. The news came as a shock to me, as I had known Art from the time he was a young child., when I used to visit his dad, Walter, VO1AG on Liverpool Avenue, in St. John’s. Art was well-known, not only to his friends in amateur radio, but to a larger circle of listeners to C.B.C. Radio in Newfoundland. Art began his amateur radio career at an early age in 1964, when he was first licensed as VO1AX and living at home in Heart’s Content. I well remember visiting his shack, up in a dormer room in the family home at Heart’s Content. If I remember correctly, he was using a Marconi CR-100 receiver passed on to him by his father, Walter VO1AG, and a home-brew CW transmitter. Art was a faithful member of SONRA, and made a great contribution to amateur radio in Newfoundland, by conducting classes in radio for Amateur Radio Certificates at the (then) College of Trades and Technology for many years. Many VO amateurs owe their amateur certification to his teaching. In addition to being active on the amateur bands, Art became active early on in the field of computers and digital modes. Art began his career in commercial radio at CKCM in Grand Falls. Later he moved to the C.B.C., at CBG in Gander, and subsequently to CBN Radio in St. John’s and soon became a very successful announcer and producer, hosting a number of popular program, perhaps the most popular of which was his trivia program. When Ken VO1ST, Diane VO1TJ and Cleo asked if I would like to visit Oscar Hierlihy at his home in Manuels, I quickly accepted the invitation. From the minute Oscar and his lovely wife, Joan, met us at the door, I felt most welcome, as if I had visited before. Oscar ushered us to his shack and spent at least a half hour showing us his radio equipment, most of it homebuilt. Made me wish I had his technical know how. Oscar was first licensed in 1932 as VO1I and held other calls as he changed residence in Newfoundland. He received the VO1DI call sign when Newfoundland went to a single zone in the 1950’s. I could never do justice in a short article on Oscar’s lifelong involvement in radio. For interesting reading, get a copy of his book Memoirs of a Newfoundland Pioneer in Radio and Television. It relates a very interesting history of his life in communications. This book was published on his 83rd birthday last year. Well done, Oscar! Oscar was awarded the Order of Canada in 1991, a testament to his contribution in Newfoundland communications over the years. 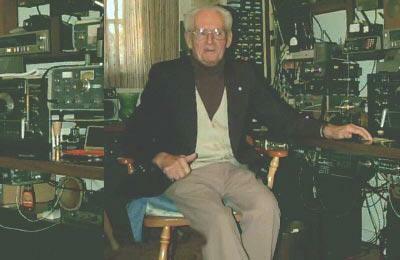 He has also received the Canadian Amateur Radio Hall of Fame Award of Honours. Before leaving I was honoured to sign his Guest Book. I will be back again Oscar before too long. Thanks for an interesting Sunday afternoon. PS: Sadly, on December 18th, 1996, Oscar Hierlihy VO1DI passed away. This will serve as a tribute to Oscar on our Web page. He will be missed.